It has been a dramatic breeding season for NTU's resident falcons. This breeding season has been a little different to previous years and has provided a fascinating, although sometimes sad, insight into the lives of our falcons. The first egg arrived in the early hours of 18 March amidst snow and freezing temperatures. Falcons typically lay their eggs around two days apart but as the weather improved webcam viewers were kept waiting anxiously waiting for the next egg. The female, affectionately known as Mrs P by viewers on dedicated Facebook pages, was showing signs of trying but failing to pass the egg, suggesting she was egg-bound which is potentially fatal. However, she eventually laid the second egg eight days after the first on 26 March. Four days later, the third and final egg arrived on Good Friday. The female usually lays four eggs but after the tense wait for eggs number two and three, it was just a relief that she looked healthy. The eggs were all expected to hatch towards the end of April but sadly this did not occur this year. On 9 May, a hole was seen on one of the eggs. During the night it was difficult to see exactly what happened but the female appeared to eat some of the shell and then later removed a deceased chick from the nest. Speaking on behalf of Nottinghamshire Wildlife Trust, Erin McDaid advised that 'due to the unusual length of time that the eggs have been in the nest it is most likely that the adult simply detected some damage to the egg or just sensed that something wasn’t right. Once this becomes apparent, it no longer treats the eggs as something that needs to be nurtured and the best way to get rid of it is to eat it. This also saves any further energy being expended in caring for it and helps keep the nest clean'. On 23 March only one egg remained, it is likely the same thing had happened to a second egg during the night. The pair continued to take turns to incubate the remaining egg until 8 June when the male finally removed it. They have been seen at the nest box since but they are not spending a lot of time there now that there are no eggs to look after. While it is disappointing that we cannot watch a brood of chicks grow up at NTU this year, it has been a fascinating and surprising season and we are privileged to have an insight into the lives of these wild birds. 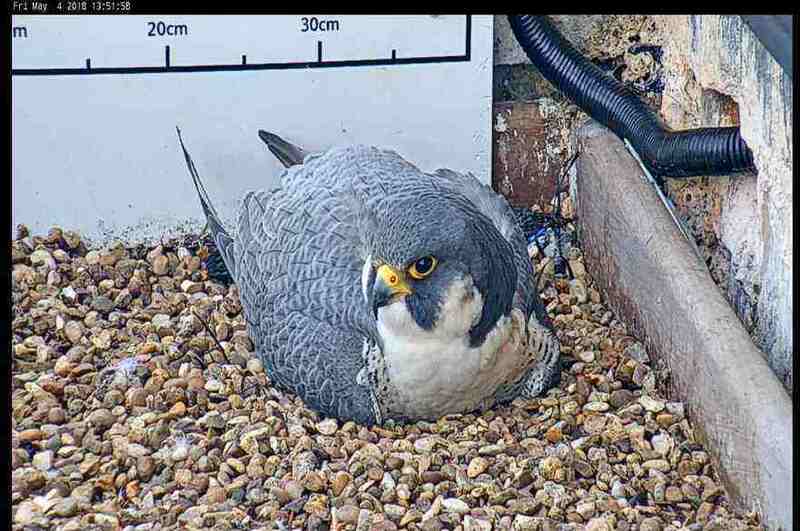 You can still view the webcams all year round and we hope they will breed again next year with more success.